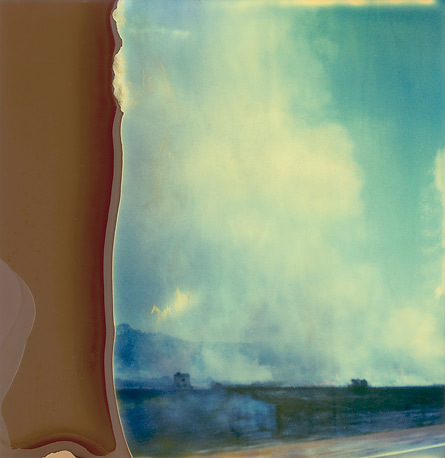 German artist Stefanie Schneider (*1968) is working with a Polaroid camera, as she loves the faded colours and unpredictable results of photos made with Polaroid films long out of date. Stefanie, who is living in Berlin, goes to Los Angeles, California for 6 moths every year to work on her photography and film projects. 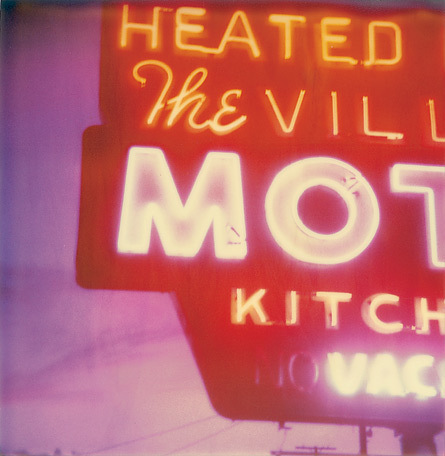 Stefanie Schnieders show LANDSCAPES & ICONS – images emblématique, which is coming up in Paris at Galerie Thierry Librati, consists of 15 big prints of her Polariods. She takes you into a dream world, where the sunlight plays a big role. You can almost feel the heat emanating from her photos and are you almost expecting to see a mirage appear in the hot air on her photos. An old motel sign, a railroad, an American car and a flag in the wind are the objects, which Stefanie turns into icons of her American dream. There are certain sub themes common to Stefanie’s work, not least that of journeying, on the road, a feeling of wandering and itinerancy, or simply aimlessness. For me, as I haven’t been to California yet, California is a figure of imagination, a big ‘film set’ for Hollywood movies. I feel that Stefanie’s photos show me some of the locations/ ‘film sets’ in between the scenes of the film, when nothing is happening. 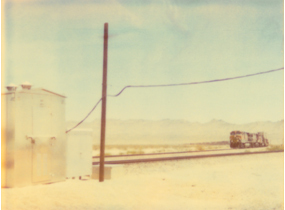 She catches something subtle and delicate about the empty urban spaces and the Californian landscape. Stefanie Schneider not only makes traditional photos, for the last decade she has been making installations combining photography, video, sound and text. See for example Stefanie Schneider’s lesbian ‘polariod movies ‘Till death do us part’ on Youtube.com. September 25 – November 30, 2009 at Galerie Thierry Librati, 30, rue de Lille, 75007 Paris, France. Opening reception 17:00 – 23:00 September 24, 2009. One Response to "LANDSCAPES & ICONS – Images Emblématiques by Stefanie Schneider"
Absolutely gorgeous work Stefanie! I love your work.